Instead, I'll just help these friends (and family *cough, cough*) out by sharing my ultimate birthday wish list. 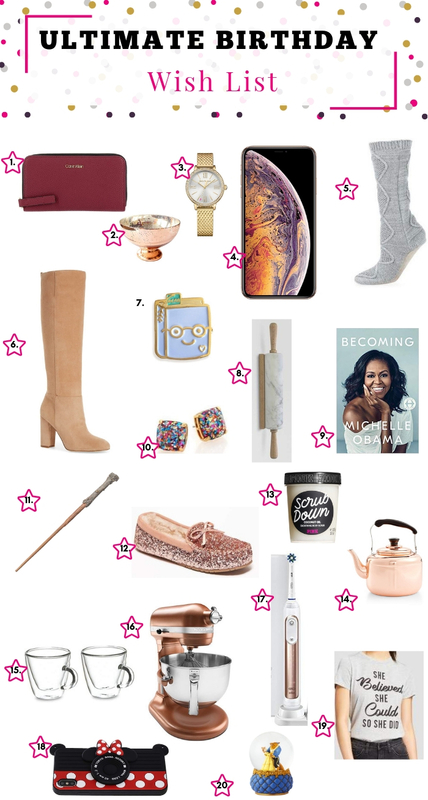 And if you have any friends who love being in the kitchen, Disney, Harry Potter, or looking stylish, then hopefully my wish list can serve as gift guide and give you some gifting inspiration. 1. Calvin Klein Wallet | I'm past due for a new wallet. My current one has rips in two of the inner pockets/compartments. I avoid putting cash or anything in those compartment for fear it getting lost. Also the fastener on it is starting to not fasten. So it's time for a new one and this CK wallet caught my eye. And it's in my power color! 2. Pedestal Bowl | I've been eying this bowl for some time now. My dream color scheme for my home is white, copper, grey, and navy blue with wood accent furniture. This bowl would look great on either the coffee table of dining room table. 3. Juicy Couture Socialite Watch | I miss wearing a watch. Whenever someone asks me if I have the time, I always look to my naked wrist before realizing I can just use my phone. And while my phone is convenient, I'd definitely like to get back in the habit of using a watch to tell time. 4. iPhone XS Max | This present actual came early. I was surprised with a rose gold iPhone XS Max last week and I'm loving it! I can't wait to play around more with the camera. I actually shot our Southern Christmas Show vlog with it. 5. Slipper Socks | I've wanted some cute slipper socks for a few years now. Hopefully, this will be the year that I get them. 6. Sam Edelman Caprice Knee-High Boot | I've had my eye on these boots for over two years. And now that my current pair of boots is about to be laid out to pasture, I'm hoping these will be my next pair. I hear that they're super comfy and the quality can't be beat. 7. Book Lover Enamel Pin | Listen, are you surprised that there's something book related on this wish list? Nope, me either. Anyone who knows me, knows that I'm book lover. Now I can rock my book lover status proudly. 8. Marble Rolling Pin | You know, I used to have a nice rolling pin to roll out cookie and pie dough, but then my kids got a hold of it. And let's just say my poor rolling pin did not survive. I only paid $2 for it from the Target Dollar Spot. So I wasn't expecting it to last forever. However, I'm hoping that this one will or at least close to forever since it's marble and a lot more sturdy than my last one. 9. Becoming | Everyone and their mama has been raving about Michelle Obama's new book. Honestly, I'm kicking myself for having not pre-ordered this one. I can't wait to read it for myself though and report back to y'all with my full thoughts. 10. Kate Spade Glitter Studs | I love Kate Spade, God rest her soul. I used to own one of her change purses and my siblings and I have gotten my mom a few Kate Spade pieces over the years. It's about time that I add another Kate Spade piece to my collection and these glittery earrings just spoke to me. 11. Harry Potter Wand | My love for J.K. Rowling and Harry Potter knows no bounds. In fact, I'm currently rereading the Harry Potter series with JJ. 12. Glitter Moccasin Slippers | How cute are these slippers?!! This mommy is overdue for a new pair of slippers and these are perfect. Besides the being super sparkly, I love that inside is lined with faux fur to keep my feet nice and toasty. 13. Coconut Body Scrub | I'm all about exfoliating. Usually I make my own body but every now and then I like to try store bought scrubs. And this one is made for dry skin which I definitely suffer from. 14. Martha Stewart Tea Kettle | Again, I'm obsessed with copper. Also, I've wanted a stovetop tea kettle for some time now. I had one years ago, but I think it got broken in a move or something and I never replaced it. 15. Espresso Mugs | These cure double wall glass mugs have been everywhere. I think they're adorable and as a coffee and tea drinker, they will definitely get lots of use. 16. KitchenAid Stand Mixer | Just think about all the things I can mix up and make with this baby! I've been wanting to get into bread making, especially since I've stumbled across some gluten-free bread recipes. If I got this stand mixer, I would be one happy baker! 17. Oral-B Pro 7500 | We're making the switch from manual toothbrushes to electric ones. They can give a bit of a deeper clean. Also, in the past I've found that the brush heads on electric toothbrushes are slightly smaller than ones of manual toothbrushes which allows them to fit better in the back corners of our mouths. Back teeth need love too! 18. Minnie Mouse iPhone Case | A new phone requires a new case. And since y'all know I'm about that Disney life, this Minnie Mouse iPhone case is too cute to pass up. I'm hoping to find cases that are Beauty & the Beast as well as Princess Tiana themed in the future. Gotta have options folks. 19. She Believed She Could Graphic Tee | This is my motto for all 2019. I'm working harder of kicking my self-doubt to the curb and believing in myself more. We limit ourselves way more than other people ever will because of self-doubt. This shirt will be my reminder that I can do whatever I put my mind (and effort) into doing. 20. Beauty & the Beast Snow Globe | I can't remember the last time I got a snow globe, but I need this one in my life. Beauty & the Beast is one of my all-time favorite Disney stories and movies. I can related to Belle on so many levels. This snow globe would look great on my bookshelf. Well, that's it guys. To all my fellow Sagittariuses, HAPPY BIRTHDAY/SAG SEASON!! Let me know down in the comments what is or was on your birthday wish list this year. I LOVE your gift list! I ordered three pairs of the glitter slippers! Thank you for posting this! They were the perfect choice. Thank you! I hope you enjoy your glitter slippers when they arrive.